This women's polished Fleur-de-Lis cross necklace in 14K gold from Apples of Gold Jewelry is a beautiful cross pendant that you will want to wear every day. 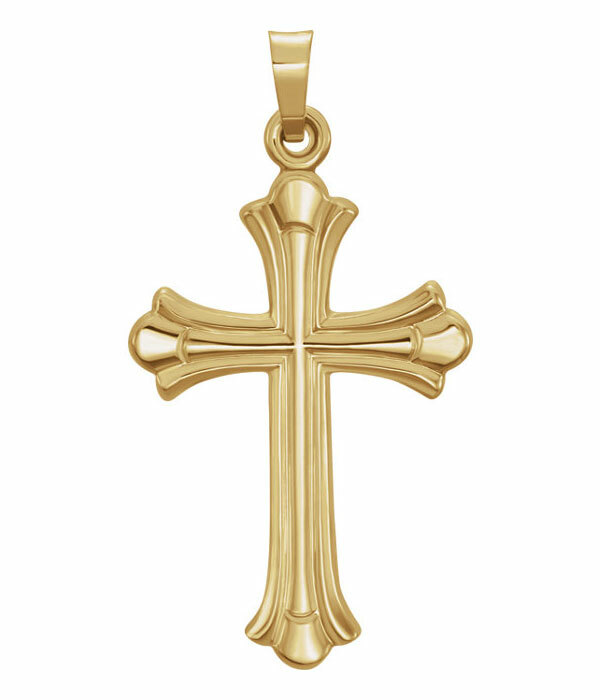 The 14K yellow gold cross pendant features a Fleur-de-Lis design all over the surface of the cross, with raised textures and a flared look to the arms of the cross. The cross of the pendant measures 1 1/8" tall by 11/16" in width. With the hoop and bale included, the height measurement is 1 5/16" tall. "1 John 1:9 - If we confess our sins, he is faithful and just to forgive us [our] sins, and to cleanse us from all unrighteousness." We guarantee our Women's Polished Fleur-de-Lis Cross Necklace in 14K Gold to be high quality, authentic jewelry, as described above.